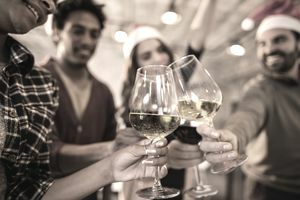 As event planners consider various options for this year's corporate holiday parties (both of the client and employee appreciation types), many are looking for ways to control costs without compromising overall value. Of course, most corporate event planners are also seeking ways to create a cheerful, celebratory environment without appearing wasteful, which is a common objective for all corporate events these days. "As event planners, we believe many companies - from small-size to large firms - will need to re-focus the holiday event on business over frivolity, striking a balance between fun and content," explains Greg Jenkins, a partner at Bravo Productions, a full-service event planning and production company in Long Beach, CA. Give this year's holiday party a bit of business focus and emphasize the appreciation message with an eye toward a great new year. This approach doesn't have to kill the holiday fun, but it can help to associate the event with more measurable and tangible benefits while providing the opportunity to recognize your top performers. In short, choose more cost-effective menu items. Skip the prime rib and turkey carving stations in favor of less extravagant options. You can even consider going for heavy appetizers rather than the seated meal. The simple decision can lower food costs and eliminate the cost of required attendants and chefs. Out of season fruits like mangoes and papayas and out of season vegetables such as asparagus and artichokes are usually more expensive around the winter holidays. When planning menu items, see if going for seasonal options helps out the budget. Even if it doesn't, you'll be guaranteed to get fresher ingredients. When it comes to the seemingly obligatory crudités, consider how they fared last year. Given the general distaste for raw vegetables among many party guests, many of those items will typically go to waste. The rule of thumb is that most guests take two bites of dessert and the remainder gets tossed. Avoid this costly waste by setting up a dessert station with small portions and smaller quantities, where guests can help themselves to bite-size or appetizer-like portions of only what they like. Go ahead and skip the cake cutting and service and full-size slices of chocolate mousse this year. Rather than investing in the use of rental linens and expensive centerpieces, choose a venue that already incorporates these stylish elements. While holiday decor can get you in the holiday spirit, lighting can do wonders on a tighter budget. Work closely with the venue on creative ways they can position lighting in the room to enhance the festive atmosphere. It is always more cost effective to build the holiday party event catering from a luncheon menu as opposed to a dinner menu. Not only will the menu options save money, but a daytime event during the week can also cut the guest list in half by limiting guests to employees or clients only with no spouses or personal guests. But if you are still set on hosting an evening event, remember that formal attire generally means that guests will expect a higher-end food and beverage experience, which will increase overall costs. Make it business casual instead. Many more organizations have been doing this in the last few years. A couple successful strategies include offering a signature drink, limiting options to beer and wine, or offering a two-drink maximum. Another suggestion is to eliminate alcoholic beverages completely, which also eliminates any potential liability. Know your organization and opt for a strategy that will suit as many people as possible without carrying the costs of an open bar. Rather than spending money on a jazz trio or other live musicians, work with your venue or catering manager to explore options for playing background music in the room. Many venues have great free music selections available. Co-hosting the holiday party with another association, professional group, another internal department or even important business partners can help defray costs, while providing a lot of networking opportunities. Sometimes it just comes down to the knowledge that it never hurts to ask. Even a savings of 1% or 2% discount can be significant when added up for everything from food to beverages and venue rental to staffing. You might be surprised what a good venue will do to secure your business.